…At least when it comes to certain edible invasive plant species such as Japanese Knotweed. This bamboo-looking, jerk-acting plant spreads like microbes on a poop pile (that is to say, fast and effectively) and grows up to 15 feet tall in thick, impenetrable clumps. Unfortunately, I have tons of it at my cabin — (no) thanks to the previous owners, two eccentric retirees who hoarded hummingbird feeders, built dozens (!) of rickety shelves and closets, and walked their cat down the road in a baby stroller. Aside from the public cat parade, they were private people and purposely planted Japanese Knotweed to cultivate a you-can’t-see-me foliage wall around the front of the house. The knotweed grew at the front of the house. And on the side of it. And across the gravel driveway / edges of the road, as Japanese Knotweed has sumo-strength and can penetrate paved surfaces. Now, it is insidiously snaking down the backyard hill on the way to the stream, which would be ultimate fuel for its hellfire. Many people eradicate Japanese knotweed with herbicides, but I don’t want to put poisons in my soil. Instead, each spring I hack away at the broomstick-thick shoots as they emerge and dig up as many of the gigantic, brain-like, mother rhizome nubs as I can before crumpling into an exhausted heap. Thanks to fabulous foragers and invasive chefs de cuisine such as Ava Chin and Wildman Steve Brill, I’ve learned that Japanese Knotweed is a delicious edible, tasting of green apples and rhubarb with a light vegetal note. According to Brill, it’s packed with vitamins A and C, has potassium, phosphorus, manganese, zinc and the antioxidant resveratrol. It is most delightful when harvested young, less than a foot tall and still juicy. As it ages, the stalks turn dry and woody. 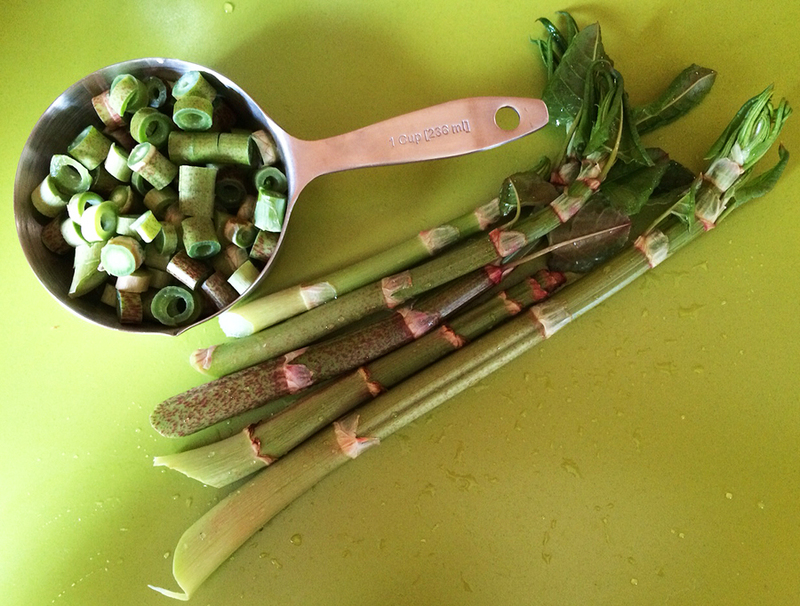 Knotweed can be sautéed, baked, jellied and more! 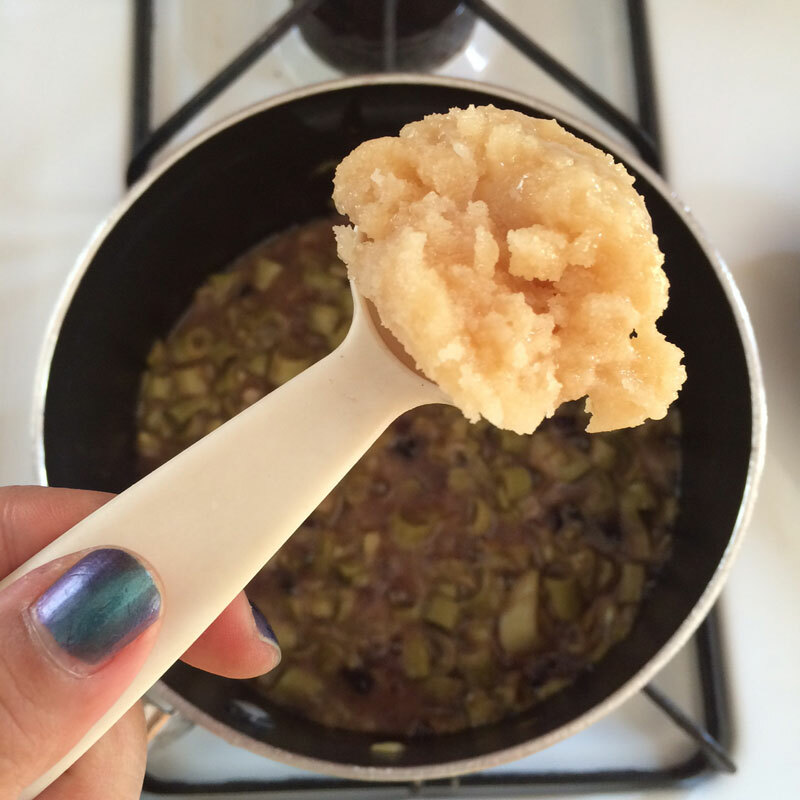 The following recipe is adapted from the 3 Foragers blog to accommodate what I had lying around the house. 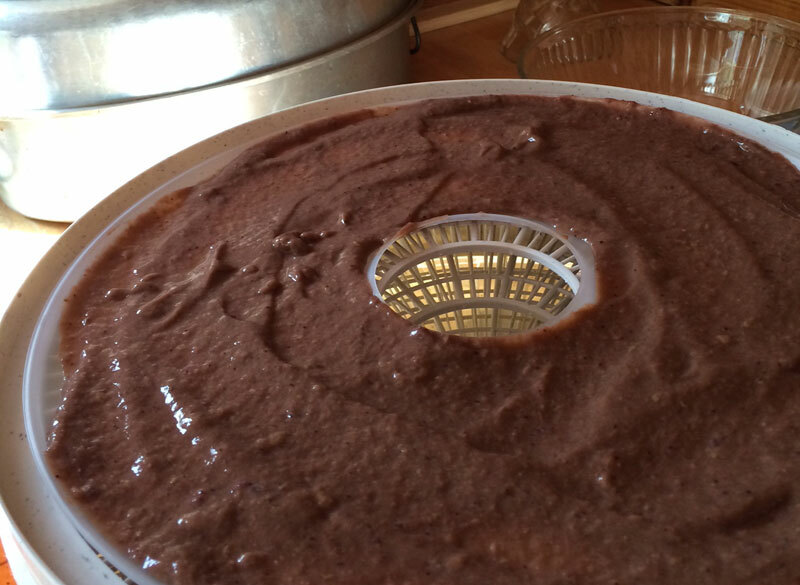 It requires the use of a food dehydrator. If you have tips for dehydrating fruit leather in an oven or other system, please share the deets in the comments below! Add knotweed and water to a pot and bring to a boil. The journey from terror to tasty begins! Turn down to a simmer and let cook for 10 minutes, stirring often. Maybe I was generous with those tablespoons of honey. Puree with hand blender or other blending machine. Add puree to dehydrator fruit roll sheet. Follow drying instructions of the dehydrator manufacturer. When done, peel off and enjoy! Refer to photo at the top of this post for the full, fabulous, finished effect. And that’s it! 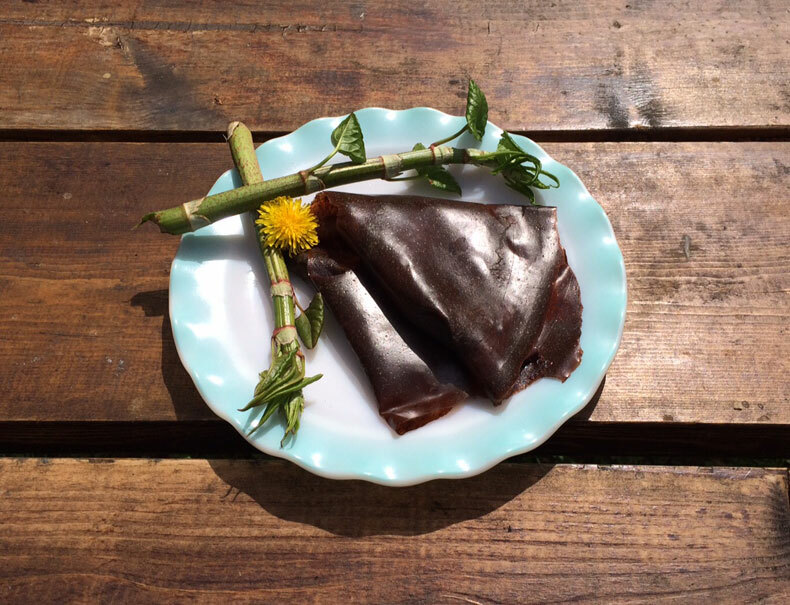 I am particularly fond of this recipe because of how much Japanese Knotweed you must vanquish to produce the fruit leather. 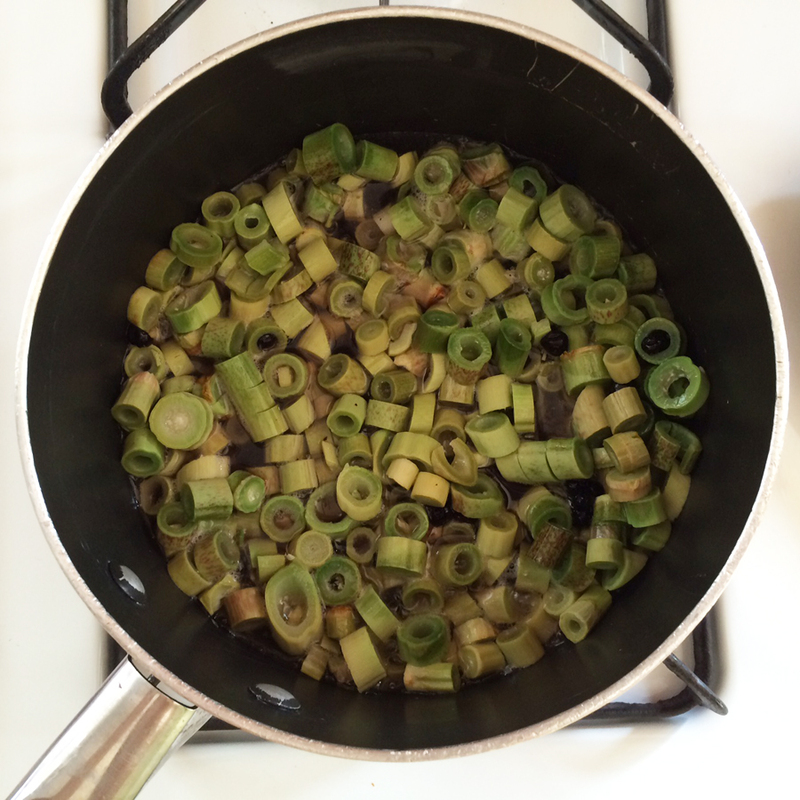 Eating four cups of Japanese knotweed sautéed in a stir fry might personally be culinary overkill for me, but pulverized in a fruit leather, I can’t get enough of it! If you have a favorite Japanese Knotweed recipe or other tips/strategies for consuming invasive plant species, please add them to the comments below! Until next time…ENJOY EATING YOUR ENEMIES!